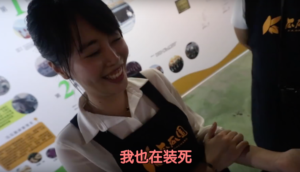 At KuaKua Yuan you can enjoy a few different activities, read below to see the activities that Foodie CaCa enjoyed on her visit! Foodie CaCa first went to visit the exhibition. The exhibition outlines the history of sweet potato farming and it’s progression throughout the years. It also highlights how sweet potatoes first arrived in Taiwan during the Dutch rule. What stuck most with Foodie CaCa is her up close and personal interaction with a termite type insect which eats the sweet potato and gives it a slight bitter taste. In a demonstration of how the farm controls the pest without using pesticide, Foodie CaCa was given the chance to have the termite on her hand much to her dismay. The result? The picture below shows it perfectly! The termite has a special ability, it fakes it death when in sight of humans! After understanding more about sweet potato and how to farm it. Foodie CaCa decides to get her hands dirty and help out in the farm! They were quick to harvesting, first some small “baby” sweet potatoes, before finding larger ones to pull out. 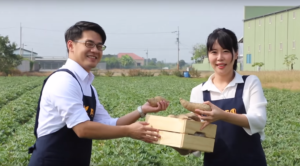 While farming they learned quick facts and tips about sweet potato farming, such as sweet potatoes are not acidic when they germinate and how the soil’s ability to hold water influences the taste of the potatoes. On Foodie CaCa’s ends her trip to the Sweet Potato Farm whipping up a sweet potato pastry dish! After struggling with her first few she picks it up and goes on to bake the small sweet potato tarts! And the results are wonderful! The sweet taste of the cream is sure to fulfill your sweet tooth! Like this article? Share it with your friends, or check out more in our Travel category and Food category! Check out Foodie CaCa on our YouTube channel! Stay updated on our social media! Be a SuperSeed Superhero – support us on Patreon! Previous articleChef Eric Teo’s Beef and Olive Rice Recipe! Next articleSamut Songkhram – the smallest Thai province with the biggest of hearts! Yellow Submarines Cheesesteaks: All Aboard! These Pets Are The Proudest Parents Ever! Chiropractic: Back in Balance with Dr Bryan Chen! Sleepy Dogs Demonstrate the Art of Naptime. The SECRET to Tasty Claypot Rice! Warung K: FIVE-STAR Ayam Bakar! Omakase at Marukyu! : No Menu No Problem! YiKouWei: Red Velvet… PINEAPPLE TARTS?! Ming Kee Chicken Rice: Steamed Chicken is Best Served… COLD? XING! Brand New Electric Race Car!? The Beautiful Dolomites! : 4 Views that you have to see! The Leaning Tower of Pisa! And The Leaning People of Pisa? Eyebrow Embroidery | BrosTalk with Andee C.
Model’s SECRET to Great Skin | BrosTalk with Andee C.
Fitness Playground at REACTIV | BrosTalk with Andee C.